One of several Free-mo setups I made in my basement. This setup includes all or my constructed free-mo module. The Bigelow module contains the station, freight house (mocked up) and the major tracks in the yard. The sawmill section(s) is not built yet. The short extension to the end of the module enables locos to safely navigate runaround moves. Bigelow is designed to be 3-4 sections and to include the main yard and the sawmill area. At present only the two sections for the main yard are built. For the setup above, I clamped a short extension to enable locomotive to run around the train. North of Kingfield the SR&RL followed the Carrabasett River much of the way to Bigelow. At White Birch Tank, a covered water tank, the railroad was right on the back of the river. The goal of this module is to show the railroad in this rugged terain. The module is two 45 degree sections that form a 90 degree curve. This module is just 16″ wide. 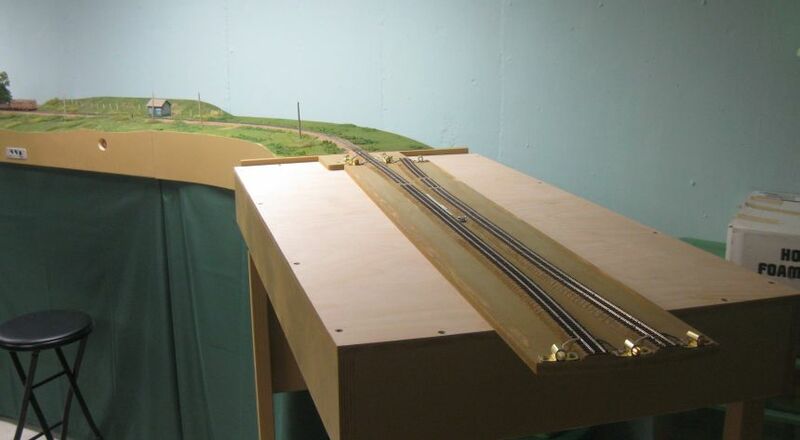 This module is inspired by South Strong flag stop, where the mainline going north diverged to the right past a small station and a spur was on the tangent track. On the prototype the spur went into a building but on the module the spur goes straight off the module. This module as three free-mo compliant ends forming the junction. It was build so that the Sn2 Crew could operate some trains continuously and then have other trains working a branch. The SR&RL crossed the Sandy River on a pin-connected thru-truss bridge into Phillips. There was a long curving fill north of the bridge. I had modeled this scene on my previous layouts and thus had the already completed bridge making this scene a easy to include on my Free-mo modules. This module consists of a four foot long bridge section and a 45 degree curved section. North of Farmington the SR&RL was in the Sandy River valley. The valley was wide at this point and there were many farms. One of those farms was the Mapplewood Dairy farm. The farm sat on a hill and was served by a small depot (once produced in Sn2 by PLW). Around 1914 a pulpwood loading spur was added North of the depot. Supposedly there was a contract to haul the coordwood north to the Strong toothpick mill. This module is four feet long and 16″ wide. I have one generic 45 degree curved module. The module does not yet have a prototype scene, so it is generic flat green scenery. I have a few ideas for a scene, but will wait until I’m truly inspired to apply the scen. To increase operating potential I wanted a staging yard and a means to run trains. A train length turntable fit the bill. For stability and portability the frame work is 2×4 feet. However, to turn a whole train, the turntable is 56″. The longer length results in the table extending roughly 12″ beyond the table. 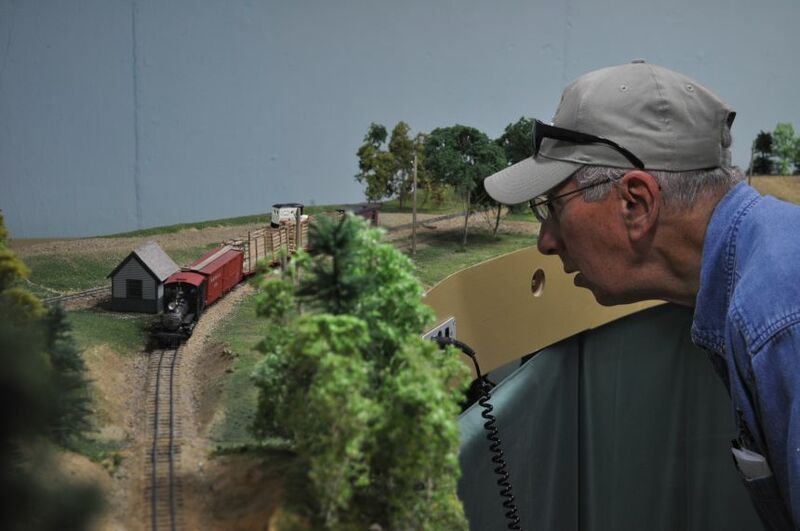 Besides being in my basement, the modules have appeared at the last two National Narrow Gauge Conventions with the Sn2 Crew. Some are not likely to fit into my dream layout. For instance South Strong Junction is quite large for a single spur. If my dream layout has space for South Strong, it will likely be a more compressed version or of different shape. Not a continuous section of the SR&RL: I’d be happier if the modules represented the K&DR (Bigelow, Carrabasett, and scenes along the Carrabasett river) or Phillips, or Farmington north. Instead I have a scenes from each of these. If I had a single continuous section of the SR&RL, then all the modules would go together to make a slice of the SR&RL and could be operated in a prototype manner. Bigelow on my present dream layout, would be the last town on the lowest deck, so the last town to build. So using it to start my dream layout seems like I’m starting wrong. The cause of my disenchantment is poor planning. I built the modules without real consideration of how they would be used later. I thought they’d just “fit”. Now they are weighing my down. Marley’s Chains anyone? The grand dreams of Free-mo and integration with a home layout are just not working out so well. I’d have been better off focusing on a single area of the SR&RL and going slower (fewer modules). Making each one more complete as I go (Sounds similar to my thoughts on layout #1). I’m not saying that Free-mo and home layouts cannot mix, but I’m suggesting that it would be better to design them simultaneously. Click to return to layouts page.